This outreach ministry would like to enhance the spiritual family of St. Joachim Parish with a common interest for parishioners who are 50 and older. We intend to nurture a Christian community by holding spiritual retreats and a variety of activities to help the parish grow in Christ. ​Nancy recently retired from Alko/Scrub Pro Uniforms in Westville and Jim has recently retired from National Technologies Assoc. They returned to the parish after Most Holy Redeemer closed. Nancy, as well as their daughter, Amanda, graduated from Annunciation School. 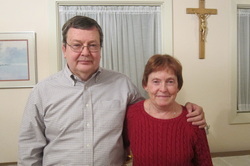 Jim and Nancy were married in Annunciation Church by Father John Wieckowski. They would like to help St. Joachim grow in Christ as a family-oriented parish. Their hope is for the outreach programs being initiated by the 50+ Club to expand the number of members and their involvement in the parish. The next Pot Luck Supper will be sometime in February. You can view the photos from previous dinners by clicking on the link below.